Data privacy statement - Welttierschutzgesellschaft e.V. We maintain a careful and secure handling of personal data and collect these exclusively in the context of the EU General Data Protection Regulation (EU GDPR) and the regulations of the Federal Republic of Germany. Personal data is all data that personally identifies you. First, we need data from our donors to carry out payments as well as the maintenance of ongoing donor relations. We also use relevant personal information, such as your name, address and email address, to keep in touch with you and keep you up to date on animal welfare issues. In addition, information about our website users and supporters helps us to optimize the website and the presentations. In particular cases, for example, if you fill in our contact form, order the cat safety passport or register for our VETS UNITED Online Resource, we will ask you to provide further information to help us assess our resources/products/services. We will not give any information to third parties. Generally, we process personal data only as far as this is necessary to provide our services and a functional website. Data is only collected if you voluntarily provide it to us, for example as part of a donation, a request or registration. Some others are automatically determined through our IT systems when you visit the site. These are mainly technical data. Information that you give us as part of a donation is saved and processed primarily to carry out the donation collection requested by you. Depending on the selected payment work, at least your full name, email address and address are required. Among other things, we also need these to send an annual donation receipt. When you choose for the donation direct debit, send us your bank details which are necessary for further donation processing as well. Credit institutions only receive your data as far as they are necessary for the processing of the donation collection. If a user realizes the possibility of donating via credit card or PayPal, the data entered in the associated form will be transmitted to the selected bank and stored. The data are therefore passed on directly to the selected bank via an encrypted SSL connection for the execution of the donation order. A transfer of the data to other third parties does not take place. The following data is collected with the form: Full name (last name, first name) with the form of address, E-mail address. For a credit card donation additionally the address (street, house number, place, postal code, country), the bank data (IBAN); Donation data (donation recipient, amount, donation / purpose of use, donation receipt desired) as well as the card type, card number, CVV / CVC verification number and validity period of the credit card are collected. The data collected is necessary for the execution and implementation of the donation order. The user's e-mail address is required to confirm the receipt of the donation order. For further purposes the data will not be used. At the time of sending the form, the IP address of the user will also be saved. We use the IP address to prevent the abuse of the donation form. The IP address is used for the purpose of prevention of beguilement and to prevent unauthorized transactions to the detriment of third parties. The legal basis for the processing of the data is Art. 6 para. 1 lit. f DSGVO. The use of our website is usually possible without providing personal information. As far as on our sides personal data (for example name, address or E-Mail address) are collected, this takes place on a voluntary basis. On our website, for example, contact forms, a newsletter registration form and various downloads are offered. If a user takes advantage of this options, the data entered in the input mask will be transmitted to us and saved. We will use your personal data only for the stated purpose, such as information work or fundraising to finance our statutory animal welfare work. We need your e-mail address to send you the newsletter or, for example, to assess your signature on a petition. The transmission of your name and your address is voluntary, however it is requested on our part in order to be able to maintain an individual approach in contact with you. As we aim to improve our resources and products and also be able to better respond to your questions and needs, we would like to ask you for additional information. For instance, if you register for the VETS UNITED Online Resource, we would like to know more about your professional background or education. If you are interested in the cat protection passport, we would like to know more about your pet. The provision of this additional information is voluntary and will help us to improve our work continuously. These are exclusively anonymized personal data and the storage serves only internal system-related and statistical purposes as well as for the identification and tracking of the accesses on our web offers. We have no way to link IP address and any known personally identifiable information. Please note that data transmission over the Internet (for example, when communicating via e-mail) may have security vulnerabilities. A complete protection of the data against access by third parties is not possible. However, to ensure the highest level of security, the Welttierschutzgesellschaft uses an SSL certificate and secure encryption when sending data by e-mail. We collect and process the personal data of applicants for the purpose of carrying out the application procedure. If a contract of employment results from the application the transmitted data will be stored in compliance with legal requirements for the purpose of executing the employment relationship. If no employment contract results from the application, the application documents will be deleted six months after completion of the staffing. After approval by the applicant, the data can also be stored longer. Our data transmission is secured. The transmission of your data via the donation forms, the newsletter registration, the contact forms as well as the download of our online offers is carried out with the security standard of the SSL (Secure Sockets Layer) procedure, which is for example also used by banks. You can recognize this by https: // in the address bar of the browser as well as at a lock symbol in the status bar. How is the personal data stored? All input of personal data on our online offers is stored on specially protected servers. Only a few, specially authorized persons who are responsible for the content or technical support of the web server have access to these servers and the data they contain. These persons have been obligated in their employment or service contracts to the observance of data secrecy according to § 5 Federal Data Protection Act (BDSG). How is the personal data used and processed? All personal data known to us are used on the basis of your consent (Art. 6 Abs. 1 lit. a GDPR) only for the stated purposes of fundraising, donation management and information work. Generally, the Welttierschutzgesellschaft does not share your information with third parties and keeps them safe. Service providers who are required to maintain confidentiality may receive the data if this is necessary for the purpose of raising a donation, processing it, or fulfilling legal requirements - but only if you have previously given your consent. It is explicitly clarified that there will be no disclosure of the data for economic use, which is contrary to this data privacy statement. The processing of the data entered in the newsletter registration form is exclusively for the sending of the newsletter. The data deposited for this purpose will be saved until your discharge from the newsletter and will be deleted irrevocably after the cancellation of the newsletter. Will the personal data be deleted? The personal data of the person concerned will be deleted or blocked as soon as the purpose of the storage is not applicable. This applies in the context of newsletter subscribers in the event of cancellation, for example via the corresponding link in the newsletter. In addition, it may be stored, if so provided by the European or national legislator in EU regulations, laws or other regulations to which the controller is subject. Also, data stored for other purposes with us (such as donor or sponsor data) will remain unaffected due to mandatory statutory provisions, including record retention periods. Revocation of your consent to data processing: You have the right to request the correction, blocking or deletion of your personal data known to us or to revoke your consent with effect for the future. The deletion of the stored personal data takes place if you revoke the consent to storage, if its knowledge is no longer necessary to fulfill the purpose for which it was stored or if the storage is illegitimate for other legal reasons. If you wish the deletion of your data, you can inform us by writing an e-mail to info@welttierschutz.org. Data for billing purposes, tax and accounting purposes are not affected by a request for cancellation. You can revoke your newsletter subscription at any time without giving reasons. 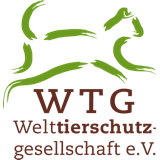 You will find an unsubscribe link in every e-mail sent by us as well as here https://www.worldtierschutz.org/tierschutznews/abmeldung. Right to data portability: You have the right to have data, that we process automatically based on your consent or in fulfillment of a contract, provided to yourself or to a third party in a standard, machine-readable format. If you require the direct transfer of data to another person in charge, this will only be done as far as it is technically doable. What else do I need to know about data protection at the Welttierschutzgesellschaft? We take data protection very seriously and work according to the minimal principle. The personal data, which we request, store and process in the context of a donation, are based on the legal regulations for donor administration. We collect as little information as possible from website visitors. However, we would like to optimize our web site constantly in order to be able to offer you a good use and the greatest possible information content. Cookies are small text files that are stored on your computer and by your browser. These do not damage your computer and do not contain any viruses. They serve for the user-friendliness of the web pages and thus the users (e.g., storing login data). On the other hand, they help us to collect statistical data of the website use and to be able to analyze them for the purpose of improving the offer. Most of the cookies we use are so-called "session cookies". They are automatically deleted after your visit. Other cookies remain stored on your device until you delete them. These cookies allow us to recognize your browser the next time you visit. You can adjust your browser so that you are informed about the setting of cookies and allow cookies only in individual cases, exclude the acceptance of cookies for certain cases or in general, as well as activate the automatic deletion of cookies when closing the browser. However, disabling cookies may limit the functionality of this site. Analytics: This website uses Google Analytics, a web analytics service provided by Google Inc. ("Google"). Google Analytics uses so-called and described above "Cookies", which allow an analysis of the use of the site by you. By IP anonymization on this website, your IP address will be shortened by Google within member states of the EU or in other contracting states of the Agreement on the European Economic Area. The information generated by the cookie and remaining information about your use of this website is transmitted to a server of Google Inc. in the USA and stored there. Google will use this information for the purpose of evaluating your use of the website, to compile reports on the website activities for the website operators and to provide other services related to website and internet usage. Google will also transfer this information to third parties if required by law or if third parties process this data on behalf of Google. Google will never associate your IP address with other Google data. You may prevent the collection of data generated by the cookie and related to your use of the website (including your IP address) as well as the processing of this data by Google by downloading and installing the browser plug-in available under the following link: http://tools.google.com/dlpage/gaoptout?hl=en. To optimize our website appearance and publicity of the association we use the advertising program "Google AdGrants", which is free for non-profit organizations, and, as part of this, the conversion tracking. When a user clicks on an advertisement that we serve, a cookie is placed on Google's search results and the action is recorded. This does not serve for the personal identification -- which is not possible for us doe to the anonymization of the IP addresses -- but to recognize the behavior of a user and subsequently for the improvement of the website design. If you are logged into one of the networks and visit one of our sites at the same time, a connection to the named servers is made. We hereby expressly point out that, doe to recognition of your browser, the information of which website you visited is automatically transmitted to the servers of the networks. To ensure a privacy-compliant integration of Youtube (YouTube, LLC, 901 Cherry Ave., San Bruno, CA 94066, USA. ), we already use the extended data protection mode when implementing Youtube videos. Do to that no data from our web offers are transmitted to Youtube. With the further consistent use of our website and the use of the offers of the Welttierschutzgesellschaft, you give us your consent to collect, process and use your personal data listed for the purposes mentioned here. You can revoke this consent at any time with effect for the future.